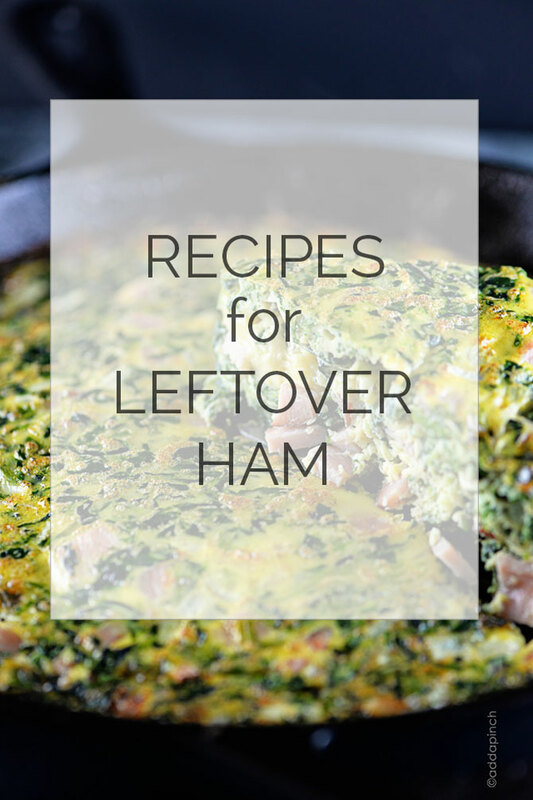 Looking for a few recipes for leftover ham? 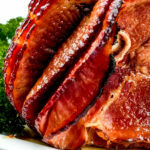 This list of ideas is perfect for making sure you use every bit of that holiday ham! Yesterday, Connie asked a question on Facebook about recipes for using leftover ham from Easter that didn’t include ham and bean soup. She really got my wheels turning and I thought it would be great to share a few of my favorite ways as well as asking you to include some of your own as well. 1. Make a quiche or frittata. 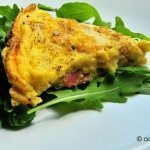 One of my favorite ways to use up leftover ham is to use it in a ham and cheese quiche or in this easy ham frittata. For the quiche, I used ham and gruyere cheese, but you could use whatever your favorite cheese combination might be. I also made this as a crustless quiche to reduce the amount of carbohydrates we had first thing in the morning, but you could easily use a homemade or store-bought pie crust if you’d like. 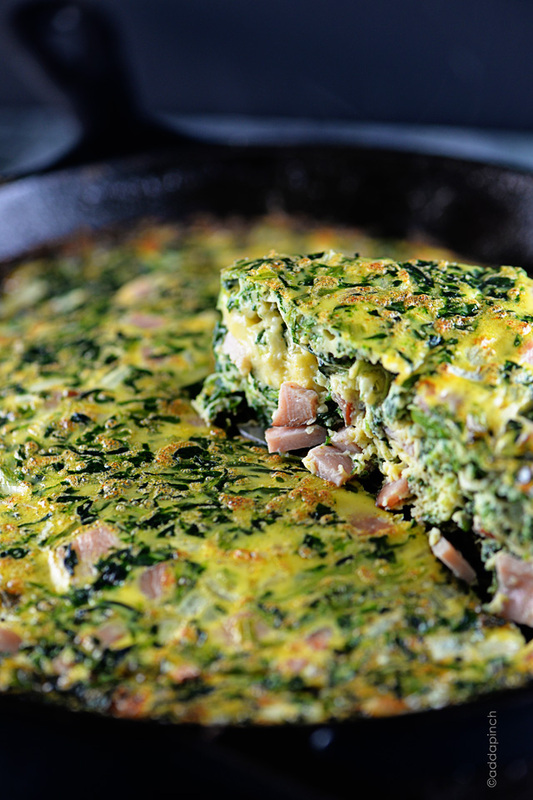 For the ham frittata, I include spinach and onions along with a few other ingredients that make for a very flavorful dish. Here’s a winner that uses two of those famous Easter leftovers – boiled eggs and ham! You can add any of your favorite ingredients to a chopped salad to use what you have on hand in your kitchen. Why not use the ham in chicken and ham roll ups? 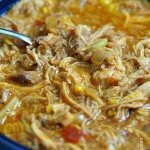 This is one of my family’s favorites and is definitely a hearty meal! Ham and cheese biscuits at just about any get together, wedding receptions, reunion, or shower in my family. They also make the perfect little nibble for game days or for sending breakfast to my husband’s office (which reminds me I should do that more often!). Easy, scrumptious, and they are also perfect to wrap in aluminum foil, store in the freezer and then warm up for a quick, hot breakfast on those busiest of mornings! 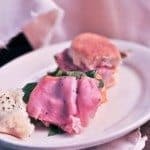 These tender, eternal favorite hot ham and cheese sammies make the perfect little sandwiches for quick suppers or when entertaining. Did you know that they freeze well, too? Just omit the spinach as you make them, wrap them tightly in aluminum foil, and store them in your freezer. Then when you are ready to serve, just reheat them in the oven. Voila! 6. Use it in a casserole. 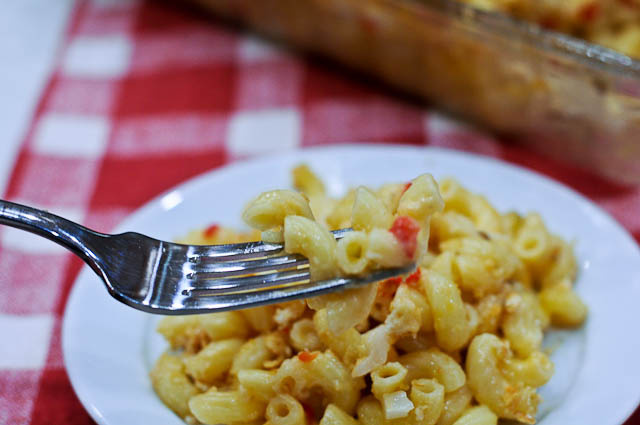 Sue had a wonderful suggestion to use leftover ham in Macaroni and Cheese! Oh my, doesn’t that sound delicious!!! Thanks, Sue for that idea. I do believe I will be making some of that myself! And you know, if you still have ham, ham, and more ham and aren’t that interested in eating it this week, why not freeze it for later? Just cut off the slices of ham and bag into smaller quart size zip top bags. Be sure to label the bags with the date you froze your ham so that you can use it in plenty of time. I also like to go ahead and dice a few pieces and freeze those in additional bags so that my prep work is all done for me for quick salads, quiches and other dishes where I’d need diced ham. Don’t forget to save that ham bone, too! 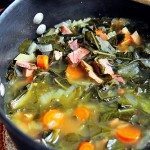 Toss it into a zip top bag, label it, and you have the beginnings of a pot of turnip greens, pinto beans, black-eyed peas or other vegetable that is flavored just perfectly by simmering away with the ham bone. 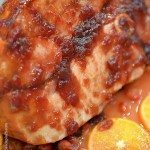 More recipes for using ham. What are your favorite ways to use leftover ham? Perfect timing, Robyn. We only eat meat on the weekends, so I put our leftover ham in the freezer for later. I think my kids would like the mac and cheese with ham and my husband would like the ham biscuits. Great pictures! Yummy! I love that salad. I want to try that out. I’ll cook that for my parents. They’ll surely love it! Just pinned this to my recipe round-ups. Some really great ideas. They all look so good..but, that chicken & ham roll-up, oh my!!!! Thanks!!! I usually make scalloped potatoes and ham or ham salad. 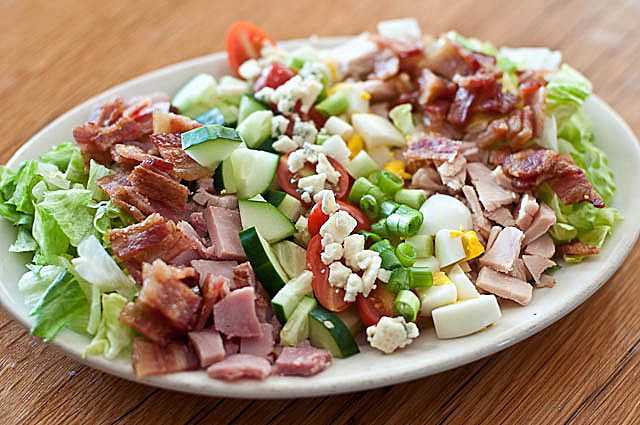 I love the Cobb salad idea, trying it for lunch! And broccoli cheese rice casserole with cubed ham added. All these recipes look delicious. We keep munching in the thing that I’m not sure there will be enough left over to make anything with. I love all these ideas, the frittata looks delicious!!! My favorite recipe for leftover ham is Byerly’s Wild Rice Soup. Byerly’s is a grocery store in the Twin Cities, and once you’ve tried this soup, you will want to make it over and over!! !